A carminative and gastric stimulant. Made of a mixture of herbs and edible salts, including Samudra lavan, which is used in food preparations all over the world. 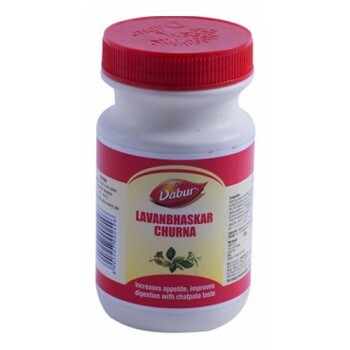 Lavan helps soften food and make it easily digestible, aids secretion of saliva and gastric juices. The herbs and spices used in Lavan Bhaskar Churna are known for their carminative, digestive and stomachic properties. 1/4 to 1/2 teaspoonful (1 to 3gm) with meals twice a day. Avoid Oil, Chillies, and Heavy food. 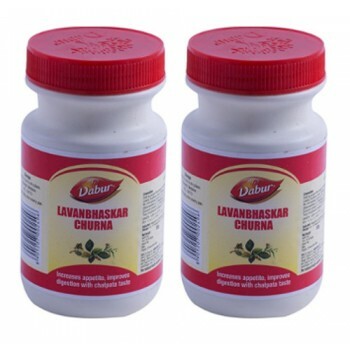 Dabur - Triphala Churna Powder 120 g This product uniquely cleanses and detoxifies at the deepe..
Charak - Aptizoom Syrup 200 ml A combination of natural herbs developed by Charak to improve ap..
Himalaya Herbals - Sunthi 60 Tablets Valued in medicine as a carminative and stimulant to the g..
Dabur - Nature Care Isabgol 100 g Absorbs water and swells up to give increased bulk in the ..
Baidyanath - Hingwashtak Churna Powder 60 g A mix of Ayurvedic herbs for the treatment of diges..